ROSEMARY: No, not the very funny Keanu Reeves/Gene Hackman movie about a ragtag substitute football team - Replacements, the tiny ad that's been running in The New Yorker magazine and probably a dozen other places for as long as I can remember. They claim to have or can get the soup tureen that went with your grandmother's china pattern, the ladle she probably used and just about anything else in any china or silver pattern ever made. And last year on the Unarmed but Dangerous tour we went to their physical store, somewhere in North Carolina. It was heaven. My particular addictions are patterns with flowers or birds. When I got married I registered for the Tiffany Audubon pattern (china and silver) and it's so beautiful that I almost never use it. Instead I started collecting similar patterns on ebay and at tag sales. Slowly. I didn't realize I was starting a collection, I just thought..."that's pretty." No wonder I liked it. looks a lot like something I already own. There must be a name for this affliction - stocking up for the enormous tea party in one's mind. And every time I try to use one of these teapots - yes..just me, the tray, the tea and a few biscuits on a pretty one of a kind plate - so civilized - the tea gets so cold. I have resisted the urge to troll through the Replacements catalog and look for mates to all of the one of a kind pieces I have. It's so much more fun to stumble upon them serendipitously. What does my husband think? He just wants to know why we always have dinner on the plain white dishes from Pier 1. Apologies for the weird spacing. I swear it did not look like this when I hit send. I love your collection, they are beautiful. If I had such a nice collection, they would be sitting in the cabinets because they are too nice to use. Besides, what if one got broken? That happened to me by the way, beautiful antique glass goblets from a flea market that survived the trip home (cross-country), but were broken by a now ex-boyfriend when I used them to serve ice cream to him. Irony is spelled in k-a-r-m-a. He was still my boyfriend after that. I should have taken the hint when he broke the glass goblets and said that I could easily get them somewhere else. Maybe he knew about Replacement, since North Carolina was where he ended up. Hoho. “There must be a name for this affliction - stocking up for the enormous tea party in one's mind.” Yes, there must be. I have that affliction, too. Considering the way my collection is growing, I fear it would not be long before I would have more tea sets than what I would know what to do with. Not that I would mind. 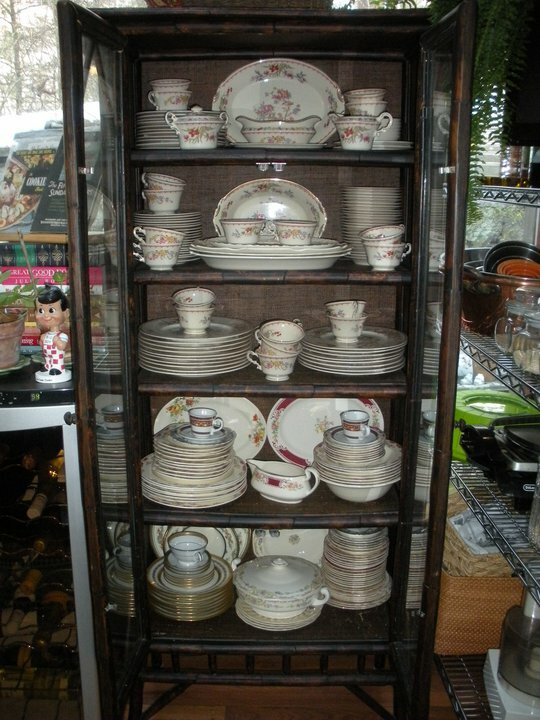 My mother has a nice collection of lovely of china, and unlike me, she uses them on a daily basis. If it was left to me, they would be sitting in the cabinet until the end of time, being too nice to use, but fortunately my mother has a different viewpoint. 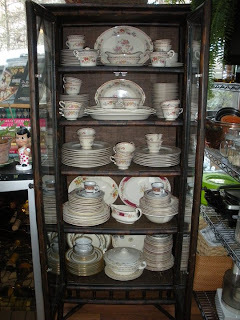 Maybe one of these days, I would take out the collection that I have and start using them, instead of the chipped green and white dishes from a department store. Maybe we should hold a Jungle red tea party! So funny Ro--the pix are beautiful! And love your husband's comment about the white Pier 1 plates! And Tigress--we can all look back and see hints we should have taken, right? Would love to see that Replacements store! I sometimes think I'm not a proper girl, as I have entirely resisted the lure of china. I appreciate and admire it, but don't covet it. At least not yet. Resisting when we registered for wedding gifts was the toughest (what is it about trolling a department store with that scanner gun that makes you lose your mind? ), but my husband and I (a) know we'd never use it, (b) were in a habit of moving nearly every year (that pace has slowed, thank goodness), and (c) just don't entertain. I have a couple pieces of china I've received as gifts, as well as my late grandmother's teapot. But on a daily basis, we use Fiestaware. I have to say, with all those colors, I've never gotten bored of it. Your china is beautiful, Rosemary! I love the birds. I've bought and sold through Replacements, but it never occurred to me to look for the store. It must be heaven! We should get together and host a killer tea party, Ro--I inherited 69 china teacups and 14 teapots from my grandmother, who did promotional work for Lipton Tea. And I have the linen luncheon tablecloths and napkins to go with them. I currently own 4 sets of Wedgewood china (inherited) which I never use. All just packed away in the attic. But for some reason, I covet Christmas china. Every year I have to talk myself out of buying something I can only use 2 weeks out of 50. Go figure. Love your pattern, Rosemary. It's gorgeous. When I was a kid my mother used this one particular set of china for holiday meals. It's Harkerware, made here in Ohio, and the color of our set is spruce green, so it was especially nice at Christmas. She gave it to me when she married her third husband and was moving into his small home (that already had his china from his first marriage). The only problem with it is that she never bought more than the six place settings we needed for our family with four kids, so it only comes out for specific dinner parties. I also bought some cream-colored Wedgewood Queensware that coordinates well with it, so sometimes I alternate the green and the cream. I've found some pieces at antique stores, but foolishly passed up buying an entire set once, and have never seen that much unbroken/cracked of this pattern since. Still kicking myself. I'm a minimalist when it comes to china, but I confess a small addiction to Fenton blown glass animals...bears, cats and elephants in particular. 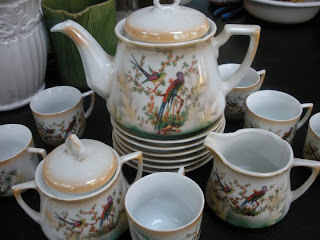 It makes me happy when I can find one at a garage sale or estate sale :o) We're actually trying to cut down on collectibles these days, but if anyone thinks Replacements can find me my Noritake pattern, I would be there is a heartbeat! Oh, I love china. LOVE it. ANd Ro, I'm laughing because--use it? OOh. Not sure about hat. We checked in the recesses of our basement a few years ago--and found a whole box of Havilland that some former owner had stashed years and years and years ago! Talk about buried treasure...I washed it all and it's gorgeous..White with pale pale green and lavender and Grecian urns. I use our good stuff for dinner parties. When I used to have dinner parties. BtB. Before the Books. But we actually USE Dansk white with green borders. Because when it chips, I can get more. I didn't get the china appreciation gene. It's simply not what I yearn for when we wander around an antique shop or flea market. Fifty year old manual typewriters? Absolutely. My partner, however, loves, loves, loves china and glassware. She picked up the passion from her late mother and inherited much of her extensive collection. Our china closet is filled with beautiful things, which is okay, but boxes and crates filled with more beautiful things sit in our basement. We've been talking about going through it and putting some on ebay. I'll believe it when it happens. I completely understand, Ro. When I drove across Ohio I stopped at the Fiestaware factory and at lots of Salvation Army stores in hopes of finding some of the pottery Zanesville was famous for. I love un-fine china... I've never seen Harkerware before but I could easily develop a passion for it. When I got married in '69 we picked out stoneware with a handpainted cobalt-blue pattern made by Arabia. I still love the stuff, use it every day. When I drop it it bounces. Sadly it's become "collectible" so replacements (at Replacements, for example) are pricey. But my husband trolls for it on eBay and every once in a while scores another serving dish. 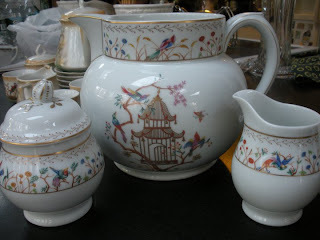 I found my mother's Noritake pattern on Replacements. It wasn't easy, but I found it. I'm sort of a minimalist, too. I never registered for China either. It seemed too grown up at the time. But I inherited my mother's Apple Franciscan Ware, and later her Noritake. I don't actually even like the Noritake pattern, and neither did my mother (it was a wartime gift from a boyfriend of hers stationed in Japan), but we used to every day at home. And after my mother died, it became precious to me, and I replaced various pieces from REPLACEMENTs. I'm really a sucker for glassware though - and pottery. But I keep it to a minimum because I'm always wondering where I'm going to store everything. Oh, this pushes all my buttons. I SO have the china gene. And teapots. Maybe it was all those imaginary tea parties we had as kids. I have loads of Fiesta Ware (most not vintage, sadly), sixteen place settings of Aynsley Golden Crocus, various blue and white plates from Anthropolgie that I use mostly for everyday. But the china of my heart is Burleigh Blue Calico, which my grandmother started buying for me when I first moved away from home. I also have Burleigh Arden, and a couple of pieces of Burleigh Lottie Blue Chintz. My Calico pieces have dwindled over the years from attrition, but my dream is eventually to restock in all those Burleigh patterns. I have at least a dozen teapots in my kitchen and dining room, but I have a little justification in that I do actually make a pot of tea--using loose tea--at least twice a day. Let's not talk about the stuff in the attic. It's a sickness, a real sickness. A couple of years ago, I picked up five Burleigh Blue Calico mugs at a neighbor's garage sale for a dollar apiece. In perfect condition. Had to pinch myself to keep from telling the lady what she was selling. Wow, we really do need to have a tea party. Sheila, can't believe you haven't pitched a tea shop cozy! I have some green goblets that came from my grandmother. I won't let my husband put them out because I don't even know what they are so can't begin to replace it. Ditto with my mom's china, which had an all-over green asian-style design. I don't even have a piece so can't try to track it down. That's why our motto should be--never pass up a chance to stock up! Hallie, the Valencia pattern is glorious. Love, love that deep cobalt color. Food looks so good on it, doesn't it? When we redid our kitchen 12 years ago I got rid of all our old Corelle and replaced it with 12 place settings of cobalt blue Fiestaware (new). Then we had a sit-down dinner here for my father-in-law's 90th birthday and invited what would have been a total of 24 for dinner, so I bought another 12 plates, etc. I love opening up the white cabinets and seeing all those deep blue dishes stacked up. About 10 years ago, I worked briefly for a career management company; one of the people who came through our program was one of the founders of Replacements. I think he thought they were going under. I'm so glad he was wrong. We used Fiestaware at our summer cottage when I was a kid -- an odd assortment of different colored plates; the iconic circular pitcher, etc. Then I completely forgot about it until the mid-90s, when a few small sources began offering it again. I immediately bought a set in original colors. Since then, I've lost a few dishes through breakage, and replaced them through Amazon -- and they are NOT the same: they are much lighter in weight (there's something so wonderfully solid about the old F-ware), and it now comes in colors the original potters would have been shocked by. I'm not a fine china sort of person, so the Fiestaware serves me well. I do have a complete luncheon set (from my mother) of etched lead glass, which I adore, though seldom use. oooohh want to google everything but I'm on a minicomputer, o/o/t with a slow connection. Looked up the casablanca though..beautiful. One day I will blog about the vintage linen collection. Sheila...YES...a tea party. Make it happen, Mme. Prez. I bought an old boyfriend a set of original yellow fiestware at the Lambertville flea market 20 years ago. I really wanted to take it when we split up but that seemed like bad form. You're right..the new stuff is not the same. Tiger, I adore Christmas china. Have Lenox, Spode and various bits and pieces. It's so cheery. Also a fool for vintage Christmas linens. I went to an estate sale today in NC wiyh Molly Weston, but I was very good - one book and a box of handwritten recipes very much like one I wrote about in my WIP. I thought it was a sign. by chance i stumbled on this site when i was looking to replace a dinner plate that got broken at christmas. i was so saddened to see, not one, not two or three, but too many of you ALL saying your nice china is too good to use. i broke an audubon dinner plate washing up after a traditonal sunday dinner. the pleasure knowing grandparents, relatives and many friends have eaten off this china for years (the good stuff) and the sterling flatware, gives us SO much more pleasure with all the memories attached to all the love around the table, more than makes up for the occasional break. WHAT ARE YOU SAVING IT FOR - GET A LIFE NOW, ENJOY IT. Doesnt even sound like a tea party is in any of your futures....so sad to think of folks with such low self esteeem and worth, they cant even eat off their own nice china! Yes, there is a name to what you all have, hoarding and low self esteem. shock your family, start living and using what you have.